I think it right, as long as I am in this body, to refresh your memory, since I know that my death will come soon, as indeed our Lord Jesus Christ has made clear to me. And I will make every effort so that after my departure you may be able at any time to recall these things. I am over two decades into my tenure as a priest of the Church, and just celebrated my 50th birthday. As Dante offered in the opening of the Inferno portion of his Divine Comedy, ""Midway upon the journey of our life, I found myself within a forest dark, For the straight forward pathway had been lost.." (Canto I) I am heading into middle age, and sometimes feel like Dante, lost along a forested path where I thought I knew the way. Mind you, this is not a "poor me" musing; nor do I come close to presuming that being 50 and now one of the senior clergy in my Church is some claim to greater wisdom or intelligence. I am still young, by my culture's standards. I am still junior to many of my colleagues in terms of service. Middle is good, though like Dante I find myself a bit perplexed on how I got here. It seems just moments ago I was afire with the energy-laden rush of being the young priest on the block. Now, though not wiser, perhaps I can claim to be a bit more seasoned. And so begins today's musing and my preparation to preach on Sunday. As I age, and experience more and more as a Rector of a parish and as a leader of peers in the Church, I am becoming deeply attuned to the personality of Peter, apostle and former fisherman. I have made a circuit of his journey with Jesus, seeking to get a leg up on others by being the first to "get" what Jesus is talking or asking about. Blurting out knowledge of Jesus and confusing it with wisdom about his mission, I was in those ranks as a younger man. I, and the people I served as a priest then, have the battle scars to prove it. I am beginning to find a new friend in an older, more experienced Peter, the Peter of the Epistles General. His is a voice that is worn, patient and while holding high standards of leadership is also able to articulate a forgiving tone. He is a restorer of people to right relationship with God, chiefly because he has stumbled and fallen along his own path and knows what it is like to be given a multitude of second chances...third, fourth, fifth and sixth chances....The Peter we encounter this week, we meet in two distinct persons united in a common experience. The first Peter is the young and impetuous follower of a radical, prophetic carpenter. He is with his teacher, James and John on the mountain top when Jesus is transfigured. He is the one who tries to stop the moment from passing, who interrupts the council of Jesus, Moses and Elijah, by offering to build shelters so that these divinely touched men can abide together indefinitely. He stumbles, bangs into the proverbial furniture and provides the comic whip that will drive the party back down into the valley and onto the road to Jerusalem, Good Friday and the Easter mystery. The second Peter we meet is looking back on the man he was, and that man's experiences, from a great distance. He remembers, and holds fast to the testimony he offers about Jesus being revealed, fully and truly, as the Son, the Beloved. These aren't myths, devised to justify. These are not arguments or apologies intended to sway. This epiphany HAPPENED, and he is testifying to that experience. Moreover, he is providing a perspective that the Church needs to grasp, I believe, if it is to prosper in the current age. You see, with an older man's eye, he is aware that too often in human experience, our testimony to truth (often to THE Truth) grows pale, even stale. Testimony becomes story. Story becomes myth. Myth becomes legend. Legend becomes either discounted or the subject of a conspiracy story on cable television. But an old man has one thing in abundance. Time to think, and experience to reflect upon. Imagine Peter, an old man now, lying awake in the night watches as older men are wont to do (yes, I am beginning to know what that feels like! ), and he finds himself in the darkness remembering what it was like to be surrounded, penetrated by the divine light of Christ, revealed in glory on the mountain top. 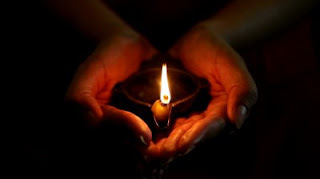 He wants us to know the memory, to receive and testimony...to hold onto it like he as an old man holds on to the feebling light of a oil lamp that provides an old man just enough light to keep up with his necessities while at the same time allowing the rest of the house some dark and quiet. Keep that lamp of memory lit, he says. Trim the wick, and feed it enough oil so it doesn't gutter or smoke. Care for that testimony...for that is our greatest legacy, and our greatest tool of witness to the love of Christ doing more through us than we can either ask or imagine. Now, I see with older eyes just how important it is to keep the wick on the lamp of memory trimmed. I can see how failing to hold testimony about God's grace, active in my life (and in yours) as it was in Peter's does not only God but everyone else a disservice. So, my counsel for you today and always....keep that wick trimmed and the lamp full, for it is often by that light that we are given opportunity to know and see what God is doing in our lives. From time to time there might be fireworks, but the real testimony is being as faithful at eventide as we are at the highest redoubts of the day.